The excitement among the RTS fans is palpable. But their glowing faces are at odds with the game they are playing together at this multiplayer beta event. 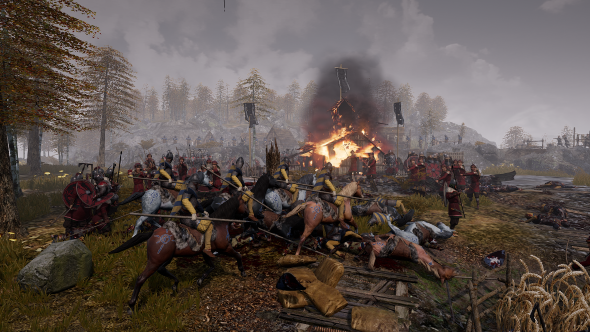 Ancestors Legacy is a squad-based RTS set in the dark, woebegone days of medieval Europe – not exactly humanity’s happiest hour. Slavs, Germanic peoples, Anglo-Saxons, and Vikings all cross swords on beautifully bleak battlefields, the web of tactics nestled within being the biggest cause of the grins staring at the screens. There is evidence enough here to say that Ancestors Legacy is really good. There is just one problem: it is made by Destructive Creations, the team behind Hatred. Related: why PEGI would not censor Hatred in Europe. It is likely that Hatred either remains an angry, offensive blur to you, or you have already forgotten about it completely. A couple of years ago, when it came out, Hatred was plastered across the gaming media for being a misanthropic shoot-‘em-up about massacring innocent civilians. Destructive Creations courted controversy to sell copies of what ended up being an intolerably dull game. It has only become more difficult to stomach as the mass shootings Hatred emulates have multiplied. It is commonly said that there is no such thing as bad publicity. Except there is in this case: Hatred earned a miserly, and utterly deserved, critic Metascore of 43. The question becomes, then, can Ancestors Legacy escape the grim shadow of the studio’s previous game? The message Gop wants to pass on is clear: the team at Destructive Creations has grown up since Hatred, and their promising RTS is all the proof we should need of that. It’s a convincing pitch. Rather than handing you a gun and telling you to kill civilians to refill your health bar (as with Hatred), the first mission of Ancestors Legacy introduces you to its history-based tactics – the distinct unit types, their defensive and offensive stances. The team behind the game make an effort to show respect for their players as people from the start – they are not out to berate you and then blow your head off as some might expect. This is best evidenced in how newcomers to the RTS genre are treated in Ancestors Legacy, the game ensuring you are not penalised for failing to grasp the nuances of its tactics system and exploit them to the fullest. The second mission is a refreshing volte-face that teaches you about line of sight and stealth. You can use environmental aspects of the map such as long grass to pounce on your enemies or set fire to a building and use it as a decoy. 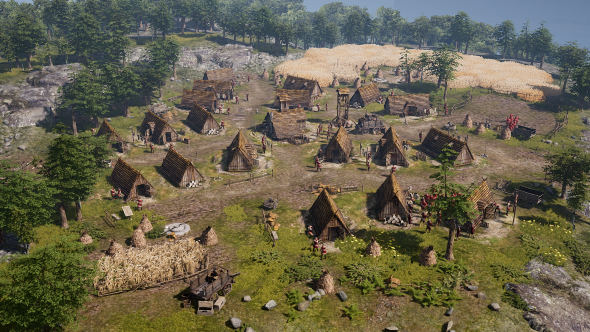 The last mission in this beta build focuses on resource management: your three primary resources are wood, food, and iron, which require careful balancing if you want to keep your army healthy, strong, and in high spirits. Your objective here is to build your army and use it to take villages and larger townships. 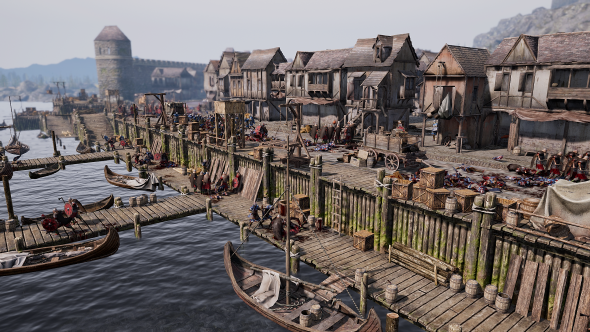 Capture more and you can network your settlements, sending peasants to work wherever is most efficient. But if one of your villages is raided you will lose productive capacity, and if a main building in a town is taken, the network is brought to its knees. While Company of Heroes and its highly-praised multiplayer is one of the hands that has shaped Ancestors Legacy, the other is clearly Hatred and its lurid violence. A voyeuristic camera allows you to zoom in on the grisly blows traded between armies, with dozens of lovingly designed kill animations. Men are hung from trees. Villagers are forcibly recruited or butchered. Soldiers are burnt at the stake, cheered on by victorious onlookers as they writhe in their death throes. This is nothing we haven’t seen before. Helped along by the distinctly Polish soundtrack, Ancestors Legacy’s scenes of medieval slaughter are redolent of The Witcher 3: Wild Hunt, especially the moment you first step foot into Novigrad’s Hierarch Square. Such violence, in The Witcher 3’s case, is contextualised. Magical beings – real, or merely alleged – are lashed to the blazing pyre as part of King Radovid’s crackdown. People are dying in this way for a reason: it illuminates the state of the world and amounts to more than gratuitous slaughter. Do Destructive Creations have similar purpose behind Ancestors’ explicit brutality, or is it a hangover from their teenage years? “We wanted to make a game that is historically inspired by medieval times,” Gop says, “we don’t like to say historically accurate because purists will always find something to criticise. The love for this time period amongst Destructive Creations is unmistakable, but it is difficult not to see it as a way for the team to retreat into the protective arms of medieval history as a way to safely retain the brutal violence that made them infamous. 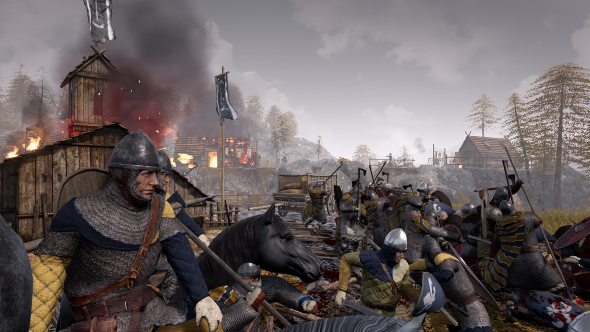 Either way, Ancestors Legacy does contextualise its barbarousness in a way that the team deliberately did not with Hatred. When you are watching a battlefield from afar like this, there are no personal vendettas, nor does it feel like an attempt to get as much attention as possible and piss off the world. “Controversy can only get you so far. People know what Destructive Creations is. People have heard about Hatred, but you’re not going to ride that pony until the very end, and we’re not doing that,” Gop claims. There are people out there who, quite understandably, will hear the name of the team and balk at the prospect of playing another of their games. However, equally, there will also be those that do not care or are not aware of their history. 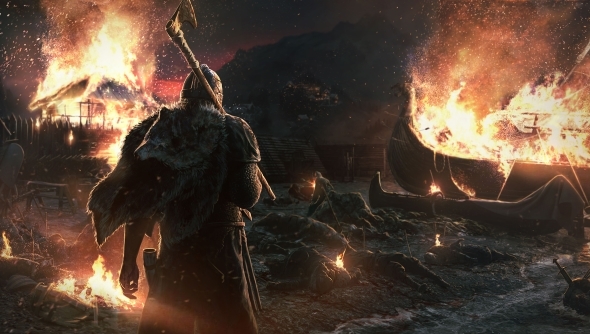 At any rate, Destructive Creations seem to be doing all they can with Ancestors Legacy to make amends – they want to make a good game and avoid promoting it in the wrong way. Can they pull it off? “What you’re going to be able to play on the release of the game is going to be the answer to the question,” Gop says. “Whether we can live up to actually being decent developers with good craftsmanship, rather than riding the controversy. Ancestors Legacy is currently slated for an early 2018 release. Let us know what you make of the game in the comments below.